We know that Fear Defies Reasoning and that we can not conquer our fears with rational thinking alone. 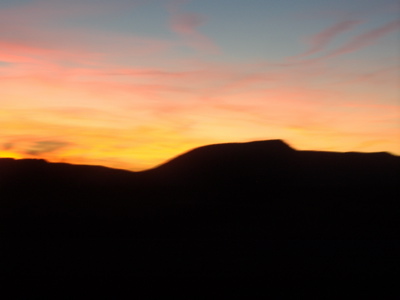 Sunset over a desert mountain north of Phoenix, AZ. Instead, fear is conditioned. It is sustained by deep rooted emotions and beliefs. Because of this, the sense of relief we feel when we avoid something we fear reinforces the fears and gives it greater strength. On the other hand, the sense of relief and accomplishment we feel when we face a fear, even in a small way, weakens the power of fear. This is what Favors refers to in the above quote. Walking through fears is exhilarating. It reinforces courage. Facing fear is similar to most spiritual or even physical exercises. There is a cycle of reinforcement that can occur in either direction. The more we face fear, the more we build courage and weaken fear and the more likely we are to continue facing fear. To the contrary, the more we avoid facing fear, the stronger fear becomes, the weaker our courage becomes and the less likely we are to face fears in the future. The cycle we choose to embrace will either lead us to a full, courageous, confident life, rich with experience, faith and wisdom, or a mundane, fearful, austere life, rich with bitterness, ignorance and regret. We are always moving in one direction or the other. If we make a conscious effort to regularly face one thing which gives rise to fear, no matter how small, we are setting the cycle in motion and becoming more courageous and less fearful. For instance, if I am afraid of heights, I can hike along a steep cliff, drive across a tall bridge, ride a roller coaster or enjoy the view from a tall building. I am more likely to follow through and be successful with those tasks before making a sky diving commitment. When we choose to face fear, we must understand that fear is the problem, not the object of fear. For example, we are not conquering heights. They are not the problem. It is the fear of heights that is the problem. By facing fears and doing things we are afraid of, not only are we building courage to more easily face fears in the future, but we are also dissolving fear by changing our belief systems. We learn, by facing our fears, that the beliefs we hold which bring rise to fear are false. We begin to understand the true nature of reality and our faith gets stronger. Fear and faith do not co-exist. Where one exists, the other dissolves.